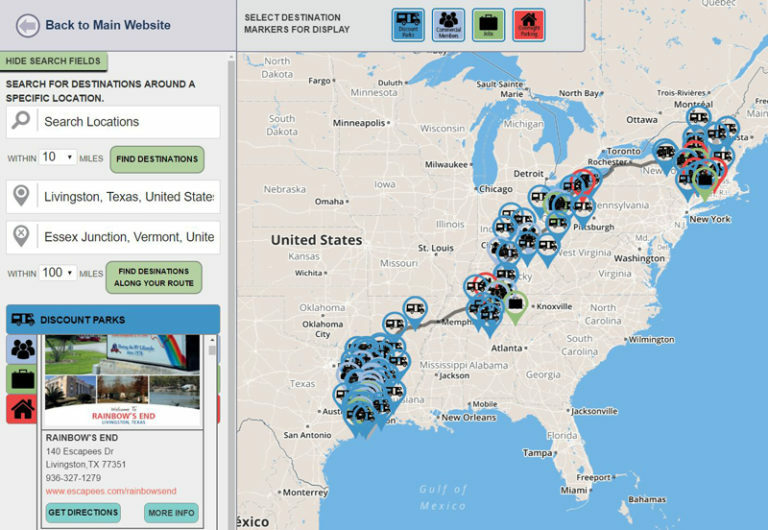 The Escapees parking system provides the most comprehensive parking resource in the RV industry! There are 18 Escapees parks located from Washington State to Florida that offer unique options for members. In addition, we partner with over 800 commercial RV parks that offer a 15 to 50 percent discount. Escapees Maps, our online mapping tool, offers a visual reference for parking opportunities and commercial members along your travel route. With a choice of short- and long-term stays, leases, and deeded and membership-type home bases, the Escapees parking program will fit your budget and your lifestyle. Whether you are looking for short-term or long-term parking, we have a park where you will connect with your Escapees family. Located from Arizona to Tennessee, these parks offer a campground section, deeded lots, lease lots, and a unique five-year-lease ERPU program you won’t find anywhere else. We helped form 11 co-op parks, RV parks available exclusively to Escapees members but managed and maintained by individual members of the co-ops. Everyone wants their money to stretch a little further, so we have partnered with more than 800 RV parks across the continent to save you 15-50% on parking fees! You can find these parks using Escapees Maps, our online mapping tool. Escapees Maps lets you plan your route from point A to point B, displaying discount parking options along the way. Gain exclusive access to a low-cost camping directory, discounted memberships with Boondockers Welcome and Harvest Hosts, and even parking options with fellow members. Through the Day's End Directory, Boondocker's Welcome, Harvest Hosts and overnight parking with SKPs, your options for low-cost, overnight parking are plenty. This online mapping tool is a compilation of Escapees parks, services, and resources complete with geographical locations. This online tool gives you the ability to search near you, by destination, or along a specific route. You can also select options based on your interests. This includes discount parks, boondocking locations, things to do, Commercial Members, etc., all with the ease of turn-by-turn navigation.